I don’t think there is anything quite as festive as being covered in tinsel and kittens. KITTENS! JIAN has released these adorable animated kittens for The Winter Gacha Festival! I cannot express just how fun these are! Especially because they meow and move… I’m a sucker for animated pets. These are perfect for Christmas gifts and at 50L a pull you can afford to get yourself some as well! I’m showing the entire collection, so you get a good idea what’s available. I’m also showing off the amazing knee socks from !Aphorism!. These bad boys are simply perfect. 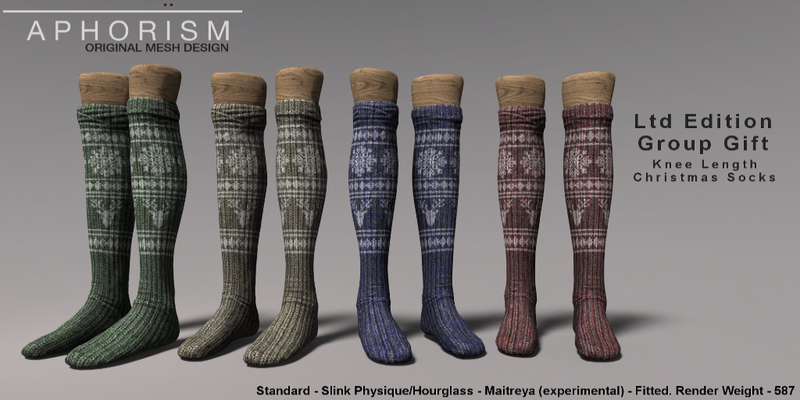 The most realistic socks I’ve ever seen in Second Life. They come in standard sizes along with the different mesh Bodies. Rucy is all about the details. The socks are Hudded with different colors and patterns AND there is a special Christmas Hud available now at The Limited. It’s free as The Limited’s group Gift! So…that’s fun ❤ Oh! I’m also loving this super cute hair by Magika! It’s got little christmas lights entwined in it! Squee! So sweet. So cute. So fun. Alright… That’s all for now! Happy Shopping!